A few weeks ago I showed you all how this dress turn out (I previously asked for color advice) and it's finally time for a tutorial so you can also try it out! To make this dress I used Ken's old sleeveless T-shirts and some fabric leftovers from a project I did years ago. Anyways, you will need either one long sleeveless T-shirt or 2 short ones. Since Ken's were pretty long I only used one but it depends on how many rows of ruffles you want and how condensed the ruffle will be. I love how comfortable this is, I actually wear it for a friend's (informal-outdoor) wedding, we danced all night and I could have not being more comfortable =] well until Ken made me spin around and I felt like I was showing my shorts, but that was a whole different problem hehe. 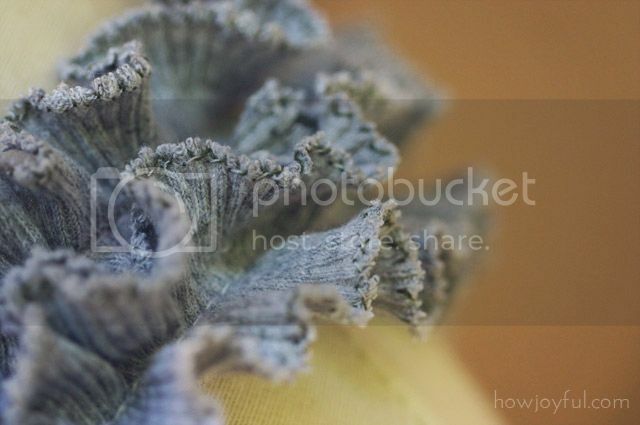 The whole project took me about 2 hours and I would say 1 and a half were ruffle making. I experimented a few different ways, hand-stitching and on the machine. So to me in the machine was faster and easier, but you can always make them by hand if you don't feel comfortable. 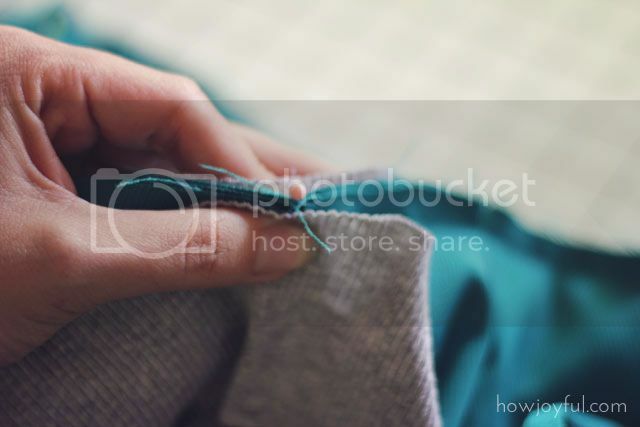 Remember to always secure the beginning and end of all your stitch lines and sew everything with 1/4″ seam allowance. 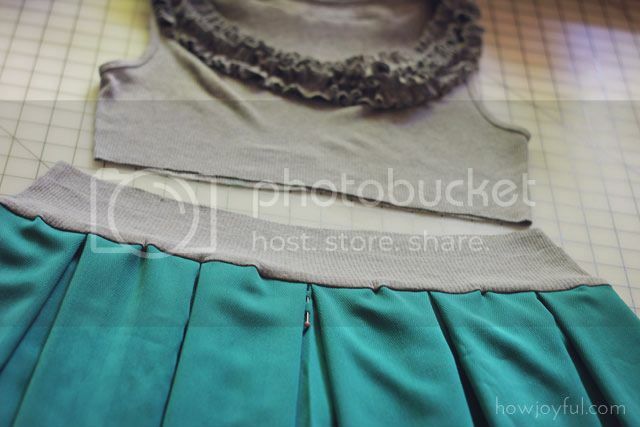 2 yards or less of fabric depending on the length and how to gather you want the skirt portion of the dress. I also made a sash with the extra fabric I cut to form the bottom. sewing machine, even tho if you want you can make it by hand with no problem. 2- After cutting, set 2 of the stripes aside to be used for the elastic belt (inside and out) I cut the stripes to make one long stripe and add 3 together to make a super long one, after that I sewed both edges with zig-zag because I don't have a serger, that will prevent the fraying on the ruffles when you wash your dress, if you like the fray look you can skip this step. 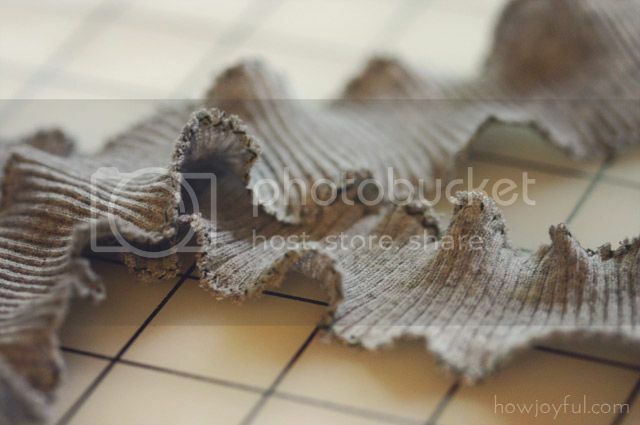 4- Measure around the neck of your shirt to know how long your ruffle or ruffles (if you decide to go with 2 or more rows) In this case I added 2 rows of ruffles and used 3 full straps of 3″ to make each set of ruffles. 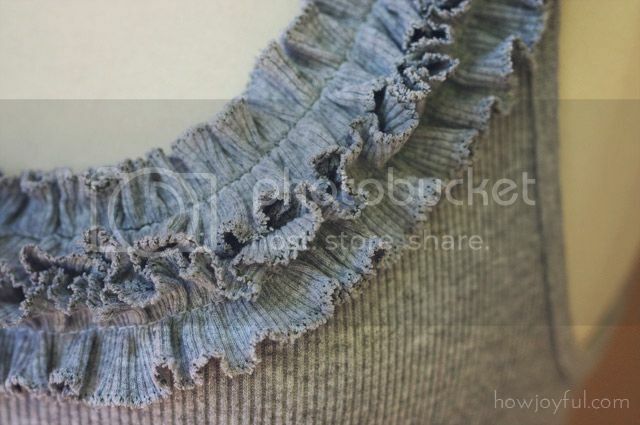 5- To attach the ruffles first make sure the T-shirt is extended either by someone wearing it or set on a dress from. Why? because that way the t-shirt will not shrink, otherwise it will not fit correctly when you wear it. 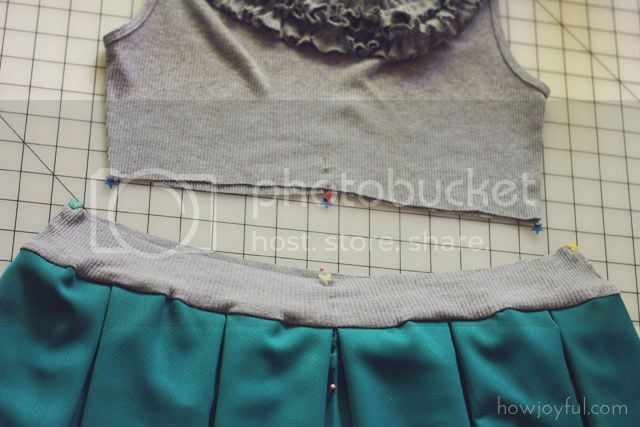 First, pin the ruffles and play with the ruffles to make them the length you need them to be. 6- For the Skirt, I used 2 pieces of 24 inches of a leftover fabric, I straighten the edges. I placed the elastic blow my bust and pin it in the end, comfortable enough for it to fit tight and loose enough to take the elastic above my head, sew it several times. I used the maximum extent of the elastic as my measure for the width of the top skirt, I made pleads around the skirt until I reached my desire measure. 7- After that with the 3″ wide strips you set aside we have to make a sandwich, keeping the skirt in the center, like it shows the image. Place the stripes wrong sides facing out. 8- Sew on the top all the way around, after that turn both stripes up. 9- Now it's time to attach both pieces together. Since the bottom is a little bit bigger, because it got stretched when sewing the skirt (remember that the skirt is wider than the T-shirt, that's why we will use elastic) we have to put pins to guide us. 10- Place pins on the sides, front and back like it shows in the image, that will make the sewing a lot easier. Place both right sides facing each other and pin it all the way around, remember to only pin the stripe that faces out because we will sew the other after we put the elastic. After you finish the dress should look done on the outside, but now we just need to add the elastic in the inside. 11- Now you just need to place the elastic in the inside, fold the edge up to the inside line and pin carefully, so that when you sew the seam line of the front goes below the back line, that way it will look clean on the outside and it will be secure on the inside. 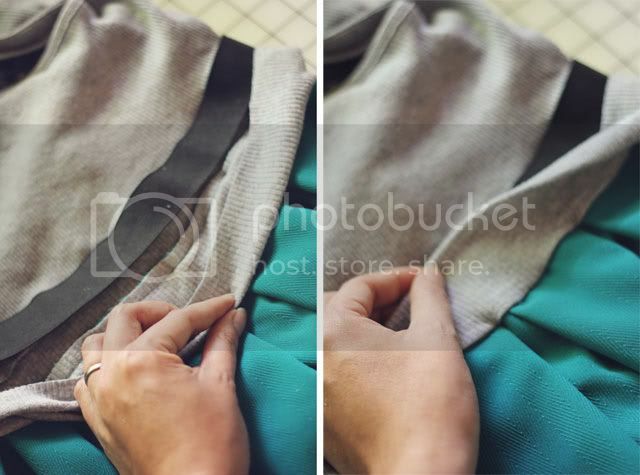 The pictures shown here are of the inside of the dress, and how I folded 1/4 inch on the top and then placed the stripe on top of the elastic, pin it and sew it. To finish the look I made a 3 1/2 inch sash with the leftovers I had from the skirt, a very simple tube that I topstitch on both edges. 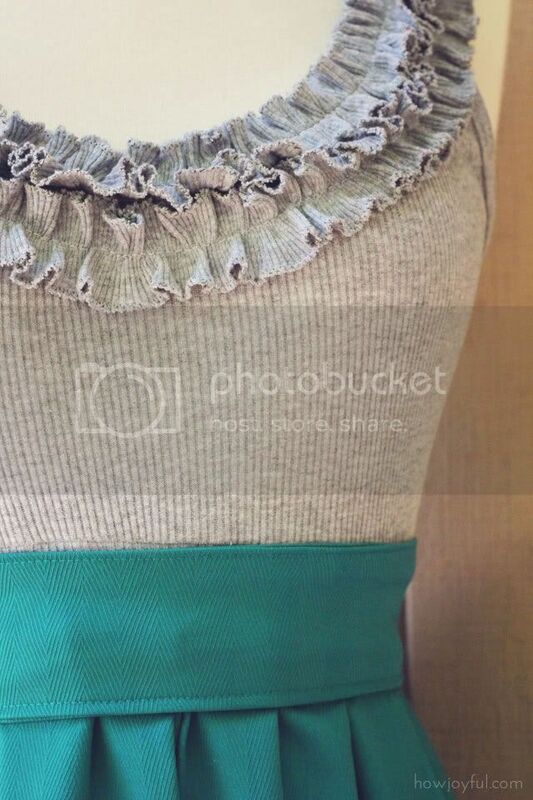 Now if you wish you can just make the ruffles with a second T-shirt and keep the length of the sleeveless t-shirt. That way you can either wear a skirt or make the skirt separately so you can mix and match. 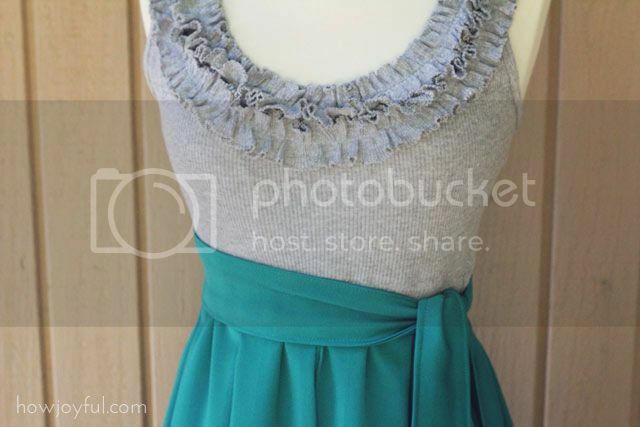 Wear a belt or sash to cover the top of the skirt and you are ready to have the exact same look, being able to mix and match with other skirts or tops =] here more images of this dress. And remember that you can mix and play with different color t-shirts and Fabric or old skirts to make different dresses and looks =] Below the first dress I made, you can see more pictures in the link. I’m glad you got your blog issues fixed, that sounds awful. My dad has always just called them ribbed undershirts, but my hubs is from venezuela and they call them the same this musculosos. It’s kind of horrible I know. In France they’re called “marcel”, an old french first name. Don’t know why ! This dress is very cute! Very creative and darling! This comment that only “white trash” refer to them as ‘ wife beaters’ leads me to believe that first, you live in the northern region of the United States and two, you have preconceived notions about others. Many people (of all ethnicity) refer to them as such. It’s more of a southern thing than a trailer trash term. YES!! Just a tank top. I hate that stupid term some people use. When I was growing up though, we called them muscle shirts. Cute dress! And these are called ribbed tank tops, or ribbed tanks for short. Wife beaters are thinner and are usually only found in white. Thanks for the tutorial! This dress is SO adorable – and you explained it super easy to make, but I doubt I could do as good of a job as you did! Love it. GORGEOUS!! Great job writing the tutorial. It sounds like I could make this in an afternoon so I will have to add it to my list of things I want to make :)Thanks!! i am in love!!! going to try making this for sure. btw, love that you are from chile. i am from brazil! Que lindo! Me tinca mucho hacerlo right now! Y que genial q seas chilena! Más me gusta, jajaja. Que genial que lo intentes Javiera! me encantaria ver una foto si lo haces, un beso! cute dress!!! The shirts are called “tank tops” here in the US when describing a women’s shirt, and Muscle Shirts when they are made for men. 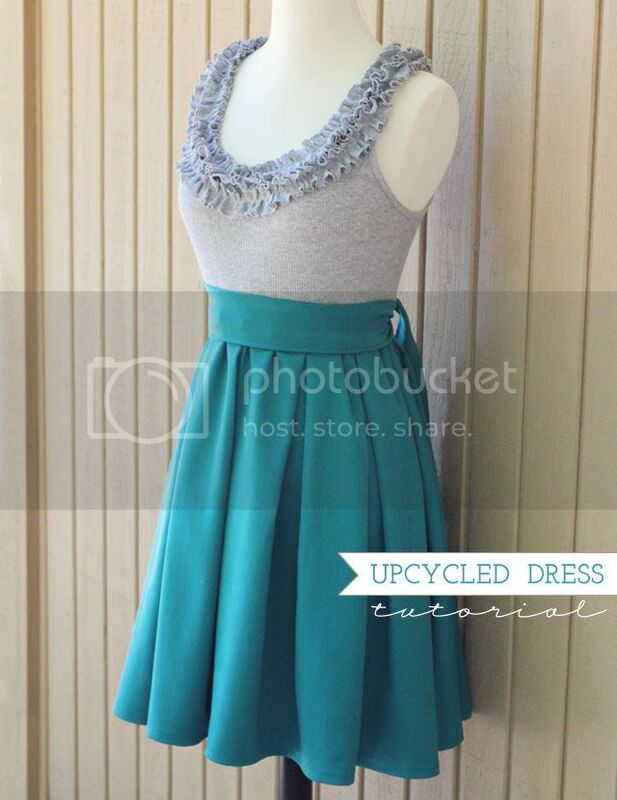 That looks so great, what colour would you recomend for the skirt part if you have a black top? Thanks so much for this great fashion item! If you have a black top anything will go with it, specially bright colors and prints! I hope that helps =] have a wonderful day! I am so sorry you are not feeling so confident =[ you should try any fabric that is thin and has a cute drop. Maybe you should also try it with less width on the skirt that might help with the bulky part =] I hope that helps and dont let a non successful project bring you down! I just finished this project and it was wonderful.. I was quite pleased with the turn out.. for my figure I was able to skip a few steps and alter it a little bit but I will soon be on to making a few more of these for my spring and summer wardrobe plus it inspired me to alter a few other shirts into dresses! Being large busted it is difficult to find dresses that cover the girls and my bra straps.. so this was PERFECT and quick! Thank you for sharing! I included a link to my FACEBOOK page that has my dress posted. 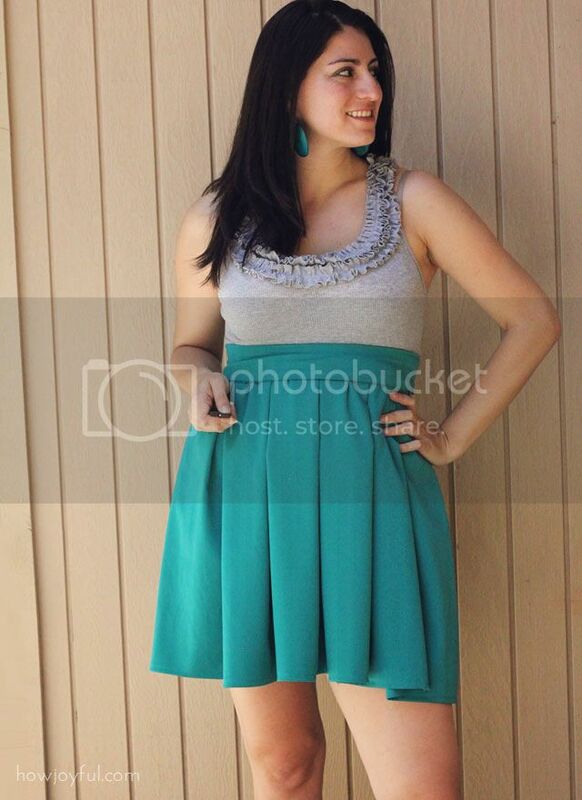 What fabric did you use for the skirt? Love this dress! Just one question, is the elastic added to the shirt at the bottom inside edge and sewn to the shirt then, or is the elastic added to the skirt when seeing both pieces together? Thanks for your help! Sewing both pieces together I meant in the previous comment? also how is the skirt made exactly, don’t you have to sew the ends together up and down the length of the dress where the edges meet? This is so adorable! but what kind of fabric did you use for the skirt part? So smart and pretty! And it seems simple too! Thanks so much for this tutorial! It’s the first day of summer (I’m in high school so my summer starts NOW (: haha) and I want to make one of these to wear because I think they are adorable! I had quite a few of these tank tops that I was going to give away or throw out because I don’t like the way they fit me anymore. But now I can use them to make a couple really cute dresses and I am so excited! Thank you! This is a beautiful dress. Thank you for the tutorial. This is amazing! Thank you so much for this tutorial. Hey :) Thanks for sharing this! I was just wondering what type of material you used for the bottom of your dress. I saw above that you said anything would work, I’m just trying to pick something that will be thick enough without doing multiple layers. Thanks! 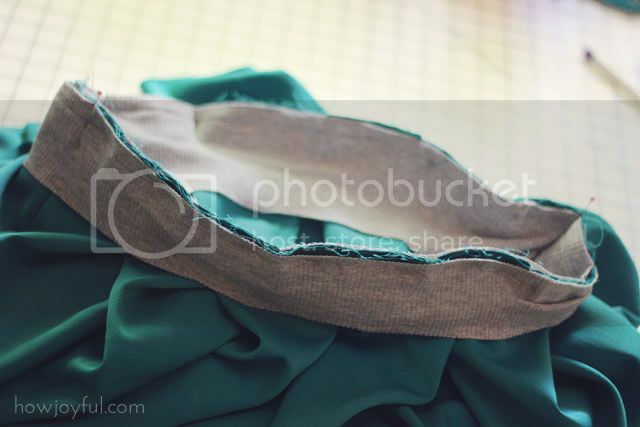 Hi Jordan, for the turquoise I used a polyester blend (no layers needed because of the thickness) and for the other one I used a “chiffon like” fabric – since it was almost see through, it needed a liner =] hope that helps! I dont understand the skirt. Can it be more especific? I mean, like a pattern to see exacly what’s the size or the form. and what’s the fabric? strech? Besides that, cute dress. Holaa, me llamo susana y de casualidad encontré su página y amé los vestidos y todas la cosas que hay aquí! más encima casi me caí de espaldas cuando vi que también era chilena! Mi hermana y yo siempre buscamos tutoriales para hacer vestidos y accesorios en general, y los suyos son realmente ossom! Si yo soy originalmente de Santiago =] solo llevo viviendo 3 años en California =] que alegrai que encontraste mi blog y que esten haciendo vestidos con tu hermana, espero me sigas visitando! un beso grande! the man’s t- shirt is called a VEST in English. Love the tutorial, I hope my dress will be as gorgeous as this! Is there a picture of the tank and skirt connected without a belt or sash in the way? So cute! I have a hard time finding dresses that fit but are still casual because I have a large bust compared to my waist. 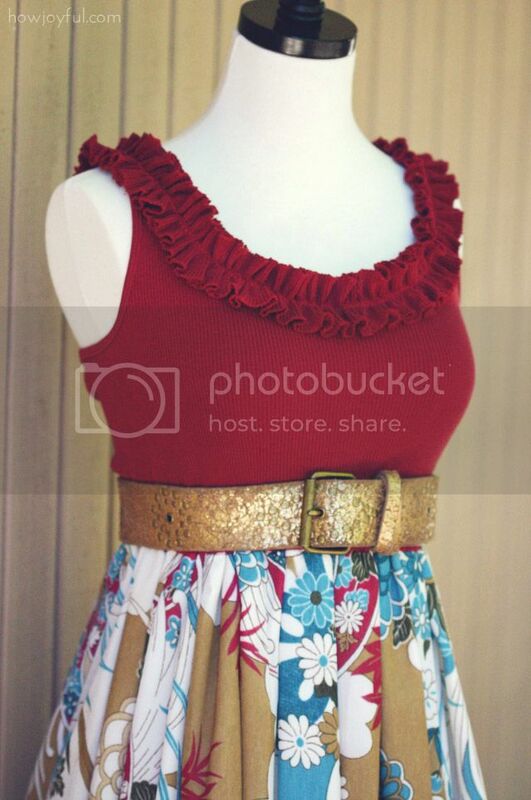 This looks so simple to sew and adjust to fit me, I have to try it for summer. Can this pattern be done using a short sleeve shirt? I love the sleeveless, but I’m a little self-conscious of my arms and would love this if it was sleeved… Cute!! i was wondering where you got your fabric for the red and multi dress? Nice, but… you wore this to a wedding? Erm, ok. So i stumbled across your blog when i saw this very adorable tutorial for this dress and was browsing through your blog when i realized that i know your husband! We grew up together!!! My mom is friend’s with his mom….. anyways, love the dress!!!!! I can’t wait to try and make my own! I love d dress!!!!! I can’t wait to try and make my own! Amazing tutorial! I was browsing, trying to find something because I went and spent all my Christmas money on fabric (with no actual project in mind) and remembered that I need clothing!!!! oops. I’m going to try this tutorial this weekend so thank you for the easy steps! one question; what kind of fabric would you recommend for the skirt? Hi! So I would love to make this dress however I am having trouble understanding how to do the skirt. You said there are two pieces so do I have to sew then together at the sides? 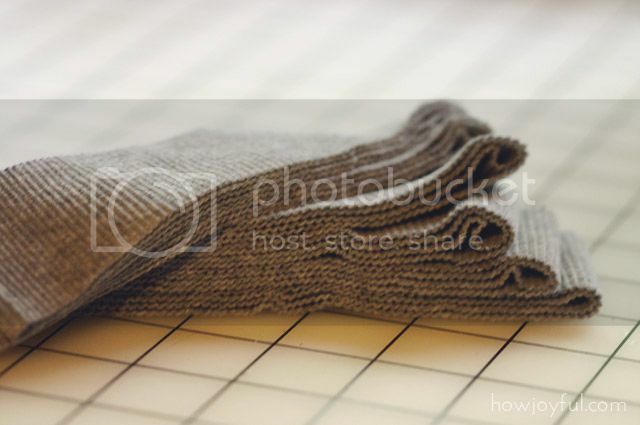 And are they just squares or rectangle pieces of cloth or a different pattern? Help would be wonderful! Thanks! Hello, great tutorial! I am literally about to hop up and do it, have my fabric and tank top picked out. I do have some questions though, but not sure if your still active or not? Number 6, what was the actual dimenstions that you used for the skirt? 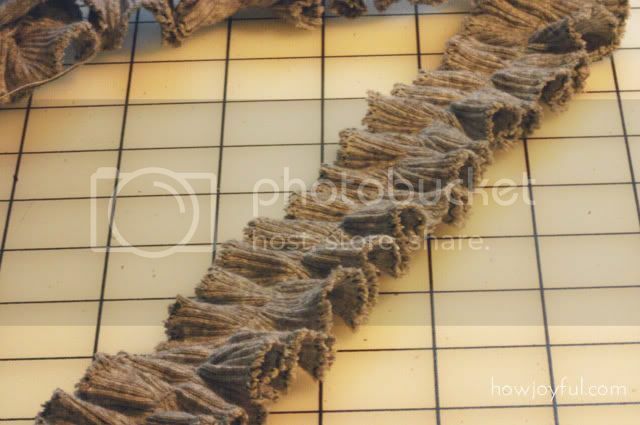 Was it a rectangle shape or like two pieces that were pleated and sewn together into a full circle? Not sure if i’m making sense, so i apologize. I have heard these called wife beaters but mostly muscle shirts which would be a direct translation I think from what you were calling them. If you shop for them at the store ribbed tanks.